We just opened our 22nd season at Winsor Music to a full house! One Winsor fan called the Oct 28th program “achingly beautiful.” Read about it and the rest of the incredibly exciting, star-studded season here! Winsor Music's fabulous season opener Remembering Gatsby is coming up this Sunday October 15th at 7pm! Get tickets here. Co-Artistic Director Gabby Díaz recounts a sweet story about her Walkman and John Harbison's piece here. Legends Gustav Mahler and Enrico Caruso are but a few of the musical apparitions that haunt the Brooklyn Academy of Music's stunningly beautiful opera house. For well over 150 years BAM has presented operas and last week I traveled to Brooklyn with A Far Cry to continue that tradition with The Crossing. 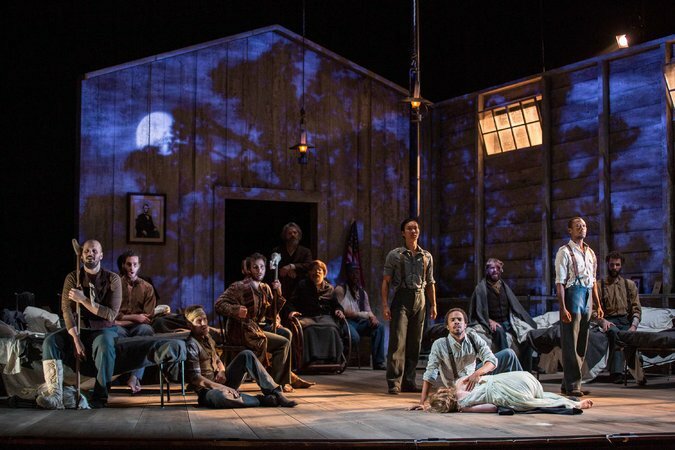 Composer, librettist and conductor Matthew Aucoin's new work is set during Walt Whitman's volunteer residency at a hospital during the Civil War. You can read the enthusiastic New York times review here. You can also read more about Walt Whitman's love of opera here. I'm thrilled to announce that I am, along with Gabriela Diaz, the new co-Artistic Director of Winsor Music, Boston's much beloved chamber music concert series and outreach organization. 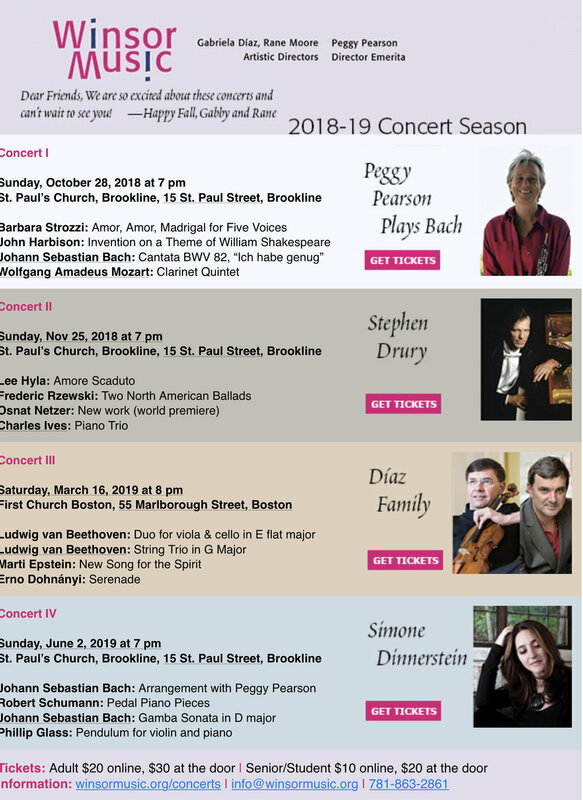 Winsor Music was founded by Boston-area super-star oboist, Peggy Pearson and is currently in its 20th season. Gabby and I are working concurrently with Peggy through the end of the season after which Peggy will retire. Oboe-lovers never fear - Peggy's unique and gorgeous musical voice will continue to be featured on the concert series. Stay tuned for details about our exciting next season. You can read Pulitzer Prize winning critic Lloyd Schwartz talk about Peggy on WBUR's The ARTery here as well as give a nod to Winsor Music's new direction. 8 days and nights of explosive new music. SICPP applications due soon! Update: The application deadline has been extended to March 1st! Two months in a row I've been in the recording studio with two of the most influential and incredible saxophonists and musicians alive today! After a few dates at The Stone amidst a month-long residency celebrating his 60th birthday, Steve Coleman and Natal Eclipse laid down some tracks for an upcoming album on Pi Recordings. And last week after a killer concert at Miller Theater Talea Ensemble recorded John Zorn's absolutely wild and beautiful wind quintet. (You can look at our shout out in the New York times here). Much to my delight the summer of 2016 was filled with opportunities to work with motivated and talented students in front of vastly different backdrops. The Summer Institute of Contemporary Performance Practice (SICPP or "Sick Puppy") at New England Conservatory kicked off the summer season with a residency by Vinko Globokar, legend of theatrical, sometimes bizarre, and always abundantly creative music. This year we helped participants stretch their instrumental skills in addition to singing, speaking, improvising, moving and all manner of inspired chaos. Apple Hill Center for Chamber Music, set in the bucolic hills of southern New Hampshire, provides the unique opportunity for musicians of all ages (12-80) and levels (conservatory student to beginner) to grow and experience community through chamber music. I can safely say everyone who attends is transformed and as a coach there for several years I would encourage every budding musician to participate. Built in the 12th century, the Rouyaumont Abbey just outside of Paris currently hosts exclusively arts related programs. Talea Ensemble stayed there for two weeks working with advanced composers and performers from around the world, playing concerts, teaching lessons, and coaching chamber music. Now that the fall season is well underway I'm happy to be back with my private students in and around Boston and my chamber music students at Mather House on the Harvard University campus. Other teaching highlights for me this season will include lectures to Music Humanities class at Columbia University as part of Talea Ensemble's year-long residency there and several other school visits with The City of Tomorrow in New England (details to follow soon!). Just home after performing two exciting concerts in Darmstadt. Here's an interview Ryan Muncy and I gave about performing "Sideshow" for the Darmstadt blog. New recording: Anthony Cheung, "Dystemporal"
Now out on the Wergo label is Dystemporal, music by Talea's own Anthony Cheung featuring performances by the Talea Ensemble directed by Jim Baker and Ensemble Intercontemporain directed by Susanna Mälkki. This is beautiful, interesting music by one of the most brilliant young composers working today. Available for download on Amazon, iTunes etc. and in physical copy here. Posing backstage with members of Roomful of Teeth, ICE, and Peter Sellars after a moving performance of Vivier's Kopernikus. Now there's a roomful of intense talent, creativity, warmth and enthusiasm! Over the moon to have been a part of this historic and phenomenal festival near my home town. Review in the LA Times here. For the next week I'll join an all-star clarinet section and ICE in presenting Heiner Goebbels' awe inspiring staging of Louis Andriessen's masterpiece De Materie. Read Anthony Tomasini's review in the New York Times here. A fantastic review in the Washington Post of Talea Ensemble's performance including a mention for the clarinets here! "With a program that includes two U.S. premieres, one world premiere and three recent commissions from the Library of Congress, the Talea Ensemble descends on DC for an unforgettable evening of cutting-edge music. Talea will continue to expand musical boundaries with their performance of Brian Ferneyhough’s new commission; in addition to new and recent pieces by Aperghis and Anderson, Talea brings to life a work by one of its own—composer/pianist Anthony Cheung."